The manor was built on foundations of Gothic castle allegedly constructed on ruins of Knights Templar monastery. It is one of the oldest in Slovakia. Owners of the Gothic castle, the noble family Horváth-Stansith of Croatia, gradually rebuilt it into a Renaissance manor. In 1588, Gregor Horváth-Stansith established a humanistic school in this family residence and continued in reconstruction of the manor in the years 1618 to 1628. It was then that the manor acquired the appearance, as we know it now. The original three-winged building was completed after fire in 1708 following a typical square-shaped ground plan with a square inner courtyard. Baron Eduard Mednyánszky moved to the manor in 1862. He brought there his 10-year son Ladislav, who became a painter of the European significance. This artist painted several captivating landscapes with original social components during his stays in the family manor at the foothills of the Tatras. An English park from the 19th century enhances the charm of the manor house. Apart from valuable historical library, the manor also contains canvasses of Ladislav Mednyánszky and the precious Ctibors stone coat of arms from the Castle of Beckov. Reconstructed manor serves to the Slovak National Gallery, which presents here its exhibitions - historical furniture and interior complements. One of them is titled “Ladislav Mednyánszky and Strážky”. Opposite the manor house stands the church of St Anna, which was built in the Gothic style. Near the church is a Renaissance belfry. These along with the manor constitute the National Cultural Monument. The Slovak National Gallery overtook the administration of the building in 1972 by transfer after death of the former owner, Baroness Margita Czóbelová. Within the castle the English park from the 19th century underwent reconstruction and revitalization, where currently the sculpture exhibition is installed. Permanent exhibition is located in the exhibition hall of the castle, where musical-dramatic and educational events are held. 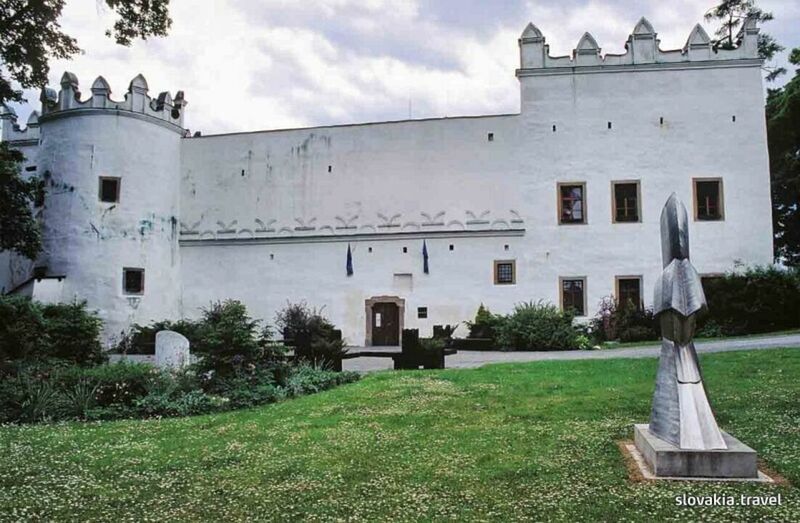 In particular, the permanent exhibition presents the work of Ladislav Mednyánsky, portraiture in Spiš region, historical library collections and the castle furniture.